In the early 1990s, Ron Suskind was just beginning a promising job as a political reporter with the Wall Street Journal when his son Owen, just shy of 3 years old, suddenly disappeared – at least figuratively. In the blink of an eye, the chatty toddler retreated into an unreachable inner world. Eventually, he would receive a diagnosis of regressive autism. The story of the next 20 years – and how the Suskind family learned to tap into Owen’s deep connection to Disney movies to reveal a hidden world of passion, motivation and emotion – is told in Suskind’s 2014 New York Times bestselling book, “Life, Animated.” In 2016, the book was adapted into an award-winning documentary film. Since the book was published, Suskind has traveled around the world to share his family’s story and advocate for the autism community. Last week, his travels led him back home to UVA, where he earned a degree in government and foreign affairs in 1981. Suskind was the keynote speaker for the UVA Autism Symposium in 2017 and currently chairs the UVA-Curry Autism Advancement Council, which works to raise support for UVA’s innovative cross-disciplinary autism initiative, Supporting Transformative Autism Research, or STAR. Led by the Curry School of Education and Human Development in partnership with colleagues across the University, the STAR initiative aims to improve the lives of individuals with autism through groundbreaking research and innovative models for intervention and training. Launched in July, its work is focused around three areas: an interdisciplinary research core, a central data system to enable secure storage and sharing across clinics and programs, and a research-to-practice system to bring the latest evidence-based research into the community. “The momentum behind the pan-University initiative in autism is remarkable,” Robert Pianta, dean of the Curry School, said. “In the span of just about two years, we have recruited a cluster of world-class scholars spanning a number of disciplines and schools and a tremendously skilled team of clinicians and researchers. That group, in this short time frame, has already developed infrastructure for research and services to individuals and families that is improving education and care and attracting sponsored research support. This year, the Curry School also selected “Life, Animated” as the 2018 Curry Common Read, a book chosen to spark conversations about diversity and inclusion among faculty, staff and students. 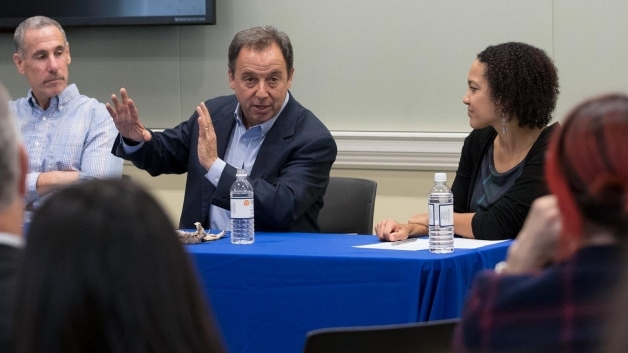 During Suskind’s Oct. 16 visit, he met with researchers, led a lunch-and-learn book talk and hosted a film screening of “Life, Animated” followed by an audience Q&A session. Throughout the day, he and the STAR team identified five areas of rapid growth and innovation that hold immense potential to improve the lives of individuals with autism and their families. For a family facing a challenging diagnosis like autism, Suskind said, the journey is often plagued by “what ifs.” When services are disjointed and a family has to work to assemble a team of therapists and doctors to get the support they need, it’s easy to feel that something has slipped through the cracks. “It’s a complex set of issues, so we need expertise from across different disciplines, from education to medicine to psychology, engineering, policy, law and more – all of these experts need to be at the table,” she said. Jiyeon Kim Becker, who completed both her undergraduate degree and her medical residency at UVA, traveled from Fredericksburg to attend Tuesday’s lunch-and-learn event with two of her four children: her daughter Katie, a fourth-year student studying public policy at UVA, and her son Jamie, a 22-year-old with autism. The STAR initiative also has a longer-term goal: changing the conversation on autism from deficits to strengths. “Changing society’s perceptions about people’s skills and abilities is part of our grand challenge,” Mazurek said. The value of a strengths-based approach is supported not only by research, but also by common sense: Everyone can understand the rush of excitement and the feeling of intrinsic motivation that kicks in when you’re pursuing something you’re intensely passionate about. Because the vast majority of individuals with autism have an intense passion – an affinity – tapping into that well is a powerful way to find and unleash hidden strengths. Suskind believes that working with affinities, not against them, is the best way to connect with individuals with autism. For his son, that affinity was Disney, but any affinity has potential. Suskind recalled how one young man explained his love for ski lifts: They’re always waiting for you at the bottom of the mountain, whether you’re a good skier or a bad skier. The gears are designed with the exact right balance of strength and flexibility. And on every click, when you’re riding the ski lift up the slope, the world looks a little different. A lot has changed in the world of autism since Owen was diagnosed. One of the most significant changes is access to data and new technologies. Suskind knows this well: he’s the founder of Sidekicks, a mobile iPhone application that combines artificial intelligence, cartoon avatars and media-rich content like film clips and images to help parents and therapists communicate with children and young adults on the autism spectrum. Now, Suskind said, we’re living in the era of data – an era with immense new opportunities to figure out what is true and effective in autism research and therapies. “We’ve never had anything quite like this before, where we can collect oceans of data that just defy the imagination,” he said. But, he added, much of that potential remains unrealized. The opportunity that the STAR initiative offers for collecting and integrating both data and technology into every part of the autism journey – from medical research through the diagnosis and lifespan of a person living with autism – offers a chance to correct that deficit. For Suskind, the neurodiversity movement – the fight for equity and inclusion for individuals like Owen – is a personal motivation. However, he also said that his work as a journalist has opened his eyes to how autism and neurodiversity are deeply intertwined with other issues of equity and inclusion, particularly race and economic status. Through his family’s experiences and his advocacy work in the autism community, Suskind said he’s seen firsthand how interventions, treatments and funding are deficient in many parts of the country and wildly rich in others. The inequality in access to these supports is a deeply rooted problem that runs into often-unexamined and unacknowledged racism. Inclusion across all of these areas, Mazurek said, is a central goal of the STAR initiative. The inequality that still exists in treatment and supports is a large reason why Suskind chose to get involved with UVA’s autism work. Advancing family-centered approaches to care, Mazurek said, is a core value that every member of the STAR team shares; that’s why they’re building a family navigation team to guide and support families in those critical moments. As the STAR project continues to build, Pianta said it will add even more partners and supports in the broader community, as part of the long-term effort to bring the knowledge and tools they’re developing to the families who desperately need it. This approach makes sense to Suskind. After all, at its core, “Life, Animated” is a story about family. It’s a story about how all of them – Ron; Owen; Ron’s wife, Cornelia; his older son, Walt; and their extended family – have traveled the journey of autism together. As for the Suskind family? They’re doing great. Owen, now 27, is living and working in Cape Cod, Massachusetts, and recently met the pope during a visit to the Vatican. The journey is ongoing, but Suskind is optimistic and grateful for the opportunity to keep spreading the lessons Owen has taught them.